Promoting engagement and achievement in science and mathematics is both an academic imperative and a critical component in developing a robust, highly skilled talent pipeline. 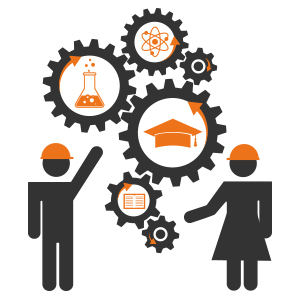 Educators face the challenge of cultivating student interest in and appreciation for STEM. At the same time, companies need to be able to attract, train and retain a solid base of qualified employees to succeed. At CCAT, we spearhead innovative approaches to enhance K-12 STEM education, career awareness, and workforce development. We create engaging, context-based curriculum, implement experiential student programming that introduces STEM careers, and offer professional development to help educators adapt to new national standards and transform their classrooms into active learning environments. We work with the manufacturing community to enhance employer engagement and provide critical assistance to job seekers. As a licensed test center, we also administer basic and technical skills assessments for core manufacturing competencies, resulting in industry-recognized credentials. Curriculum - Comprehensive minds-on, standards-aligned, STEM-themed curriculum packages for instructional day and out-of-school-time implementation models. Student Programming - Highly engaging student workshops, events and school year and summer programs that promote STEM achievement and develop career interest. Connecticut. Dream It. Do It. Professional Development - Workshops and programs for K-12 teachers, guidance counselors, and administrators transform classroom learning. Manufacturing Career Advancement - Committed to ensuring that the manufacturing sector has access to a well-trained and qualified talent pipeline. Consulting Services - Assisting in the planning, development and/or management of a wide variety of school and district initiatives. Occupations that typically require a bachelor’s degree for entry, like software developers and engineers, made up 73% of STEM employment, but only 21% of overall employment. • Over 99% of STEM employment was in occupations that typically require some type of postsecondary education for entry, compared with 36% of overall employment. Over 99% of STEM employment was in occupations that typically require some type of postsecondary education for entry, compared with 36% of overall employment. Employment in computer occupations is projected to increase by 12.5% from 2014 to 2024, yielding nearly half a million new jobs – far more than any other STEM group. Employment in STEM occupations grew by 10.5%, or 817,260 jobs, between May 2009 and May 2015, compared with 5.2% net growth in non-STEM occupations. Wholesale and manufacturing sales representatives of technical and scientific products (334,010) was the largest STEM occupation not related to computers. There were nearly 8.6 million STEM jobs in May 2015, representing 6.2% of U.S. employment. Of STEM jobs, computer occupations equals 45%; engineers, 19%.